The issue was brought to surface by CEO M Sanjivkumar who in a press conference announced about the seizure of over 9000 valid voters ID Cards in Rajarajeshwari Nagar Constituency. BENGALURU: The issue of fake identity cards has surfaced once again prominently just four days before the Karnataka Assembly election on May 12 with both the Congress and the BJP trying to target each other. The issue was brought to surface by the Chief Electoral Officer M Sanjivkumar who in a late night press conference on Tuesday announced about the seizure of over 9000 valid voters ID Cards from a flat in the Rajarajeshwari Nagar Constituency. Recently the Election Commission had found a former employee of the BBMP involved in producing fake ID Cards and arrested some persons in connection with it. Congress spokesperson Randeep Singh Surjewala has alleged that the former BJP corporator Manjula Nanjamari was involved in the 'scam'. "BJP leaders and Prakash Javadekar is only showing the audacity by misleading people of Karnataka,"Mr Surjewala said. The charge is denied by the BJP with Union Minister Mr Javadekar stating that Ms Nanjamari had quit BJPsome years ago. "It is a raid by Election Commission which has found all these things, and they have filed FIR. Congress is trying to lie loudly and pin it on BJP," Mr Javadekar said. 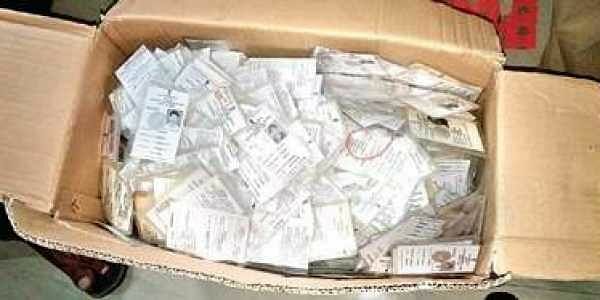 According to reports, a large number of voter identity cards were discovered at an apartment in Bengaluru's Raja Rajeshwari Nagar constituency. The house had been rented out to One Rakesh, son of Ms Nanjamari and he had unsuccessfully contested on BJP ticket in the last BBMP elections. In a late night drama, both the Congress and BJP accusing each other of interfering in the election process. It is unclear at the moment whether the voter IDs were fake or genuine. In fact the BJP along with JD(S) had sought the election commission to countermand the elections in Rajarajeshwari nagar where Congress nominee Muniratna is seeking re-election. Mr Surjewala also demanded that a high-level enquiry should be ordered by EC.